From 16 to 19 April 2018, in the city of Kuala Lumpur (Malaysia), the 16th International Asian Exhibition and Conference of Defense Services and Systems in the Defense Industry took place in the MITEC exhibition pavilion (Defense Services Asia). 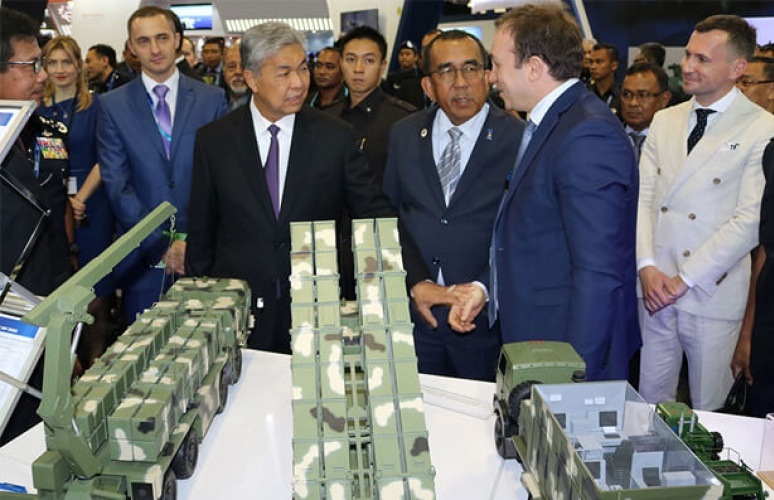 The DSA exhibition is held under the patronage of the Ministry of Defense of Malaysia and the Malaysian Police once every two years and attracts the attention of leading manufacturers and customers of military equipment and weapons from around the world. The DSA 2018 exhibition covers the ground forces, air defense, electronic warfare and communications, aviation equipment, coast guard equipment, armored vehicles and artillery systems, special small arms and special forces equipment, as well as satellite and space technology and dual-use products. DSA is one of the 5 largest exhibitions on the defense and security of the world and firmly holds the position of the leading event in the defense industry of the APR. The exhibition "DSA 2018" was placed on an area of 43 thousand square meters. m on three floors of the exhibition center. Over 1500 companies from 60 countries of the world took part in the exhibition. The exhibition featured 30 national pavilions from Australia, Austria, Belarus, Bosnia, Brazil, Canada, China, the Czech Republic, France, Germany, Indonesia, Italy, Malaysia, Norway, Pakistan, Poland, Russia, Singapore, Slovakia, South Korea, South Africa, Spain, Switzerland, Holland, Turkey, the United Arab Emirates, Great Britain, Japan, Ukraine and the United States. Along with 350 VVIP-delegations from more than 40 countries of the world, more than 45 thousand specialists visited the exhibition. The united Belarusian delegation at DSA was headed by First Deputy Chairman of the State Military Committee Igor Demidenko. GVTUP "Belspetsvneshtekhnika" acted as the collective organizer of the Belarusian exposition. At the joint exhibition site of the State Military Industrial Committee, OJSC “KB Radar”, the managing company of the Radar Systems Holding, OJSC, 140 Repair Plant, and BelOMO, were represented. During the exhibition, the most advanced technologies, the latest developments of Belarusian manufacturers in the field of fire weapons and small arms, the capabilities of enterprises for the production of lightly armored vehicles, optical and optical-electronic products, radar and electronic warfare in the field of ground and air defense, repair and upgrades of airborne air guided weapons of short range. The combined stand of the GVPK was visited by more than 300 specialists from 17 countries of the world (Australia, Austria, Germany, Indonesia, China, Norway, Malaysia, the United Arab Emirates, Pakistan, Poland, the Russian Federation, Singapore, Thailand, Turkey, France, the Philippines, South Korea). A number of bilateral meetings were held, during which presentations of new models of equipment and weapons of Belarusian enterprises were presented. The sides expressed interest in developing mutually beneficial bilateral cooperation in the most promising areas of military-technical cooperation.